Backing up is just what it sounds like — it’s saving a partial or complete copy of your data for a defined period in case your system crashes, your hard drive fails, or a disaster destroys your servers. Regularly backing up your data is really the bare minimum level of protection and should be part of your current process. It’s also a key part of any effective disaster recovery plan. But if you’re just backing up data without a broader strategy, your company could be vulnerable should disaster strike. Such a disaster could take many forms: a fire in your office, water damage, theft of equipment, or any type of natural disaster. It’s the kind of event that would destroy your infrastructure, cause long-term power outages, or deny you access to your servers for an extended period. These probably aren’t the kind of business issues that keep you up at night, but consider what such an event would mean for your company and its valuable data. That’s why it’s worth having a plan in place. How are you currently protecting your data? Where does your data backup live? Is it in same place as your file server? If your backup data is off-site, how would you access that site following a disaster? Which documents would you need to access immediately? Which plans, systems, products, services, tools, and programs do you need back and how quickly? If your office was destroyed, where would your employees work from in the short term? And what equipment would they use to do their work? 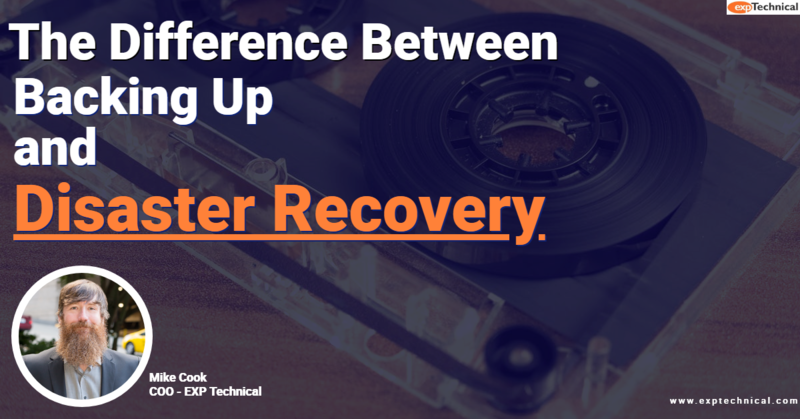 What is your recovery time objective (RTO)? That is, how soon do you need to be back up and running? What is your recovery point objective (RPO)? That is, how much data loss can your business absorb without going under? Two days’ worth? One day? Twelve hours? One hour? Answering these and other questions will help determine the size and scope of your disaster recovery plan. Brainstorming about possible disaster scenarios will also help you figure out your current level of risk. The beginning of a new year is a great time to start this conversation. The worst time is immediately following a disaster. So, if you don’t have a disaster recovery plan in place, schedule a time to chat with your EXP consultant or send me an email to get things rolling. Creating a solution to deal with the worst-case scenario will help you stay focused on running your business and give you greater peace of mind should the unthinkable come to pass.